I’m sure you dedicated Jordan heads are jumping for joy!! 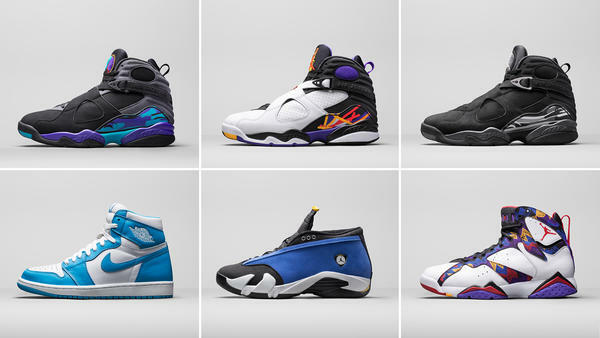 Nike and Jordan brand revealed their holiday 2015 retro releases and I must say those VII must be COPPED!! Originally debuted by the legend himself during Chicago’s “three-peat” championship basketball season in 1992-93, the Air Jordan VIII was a true showstopper on the hardwood. Featuring distinctive crossover straps atop the laces, the Air Jordan VIII was the last shoe His Airness would wear before his sudden retirement in October 1993. Jordan Brand will release three colorways of this iconic silhouette during the 2015 holiday season, paying homage to historic moments during Michael Jordan’s career. Worn originally during the 1993 All-Star Game, the Air Jordan VIII Aqua returns with fully re-mastered construction and OG materials. The classic silhouette features a black Nubuck upper, in addition to Bright Concord and Aqua highlights, that brighten the back half of the shoe. The Air Jordan VIII Three Times a Charm pays tribute to Chicago’s first three-peat championship season, while taking color cues from each of the three defeated teams. Vivid hues invigorate the white- and black-based shoe, in addition to the Infrared-toned Jumpman highlighted on the new tongue label. One of the first non-OG colorways of the Air Jordan VIII, the black-and-chrome version makes its return this holiday season. Upon its first release in 2003, the shoe became an instant classic. The black-based upper incorporates chrome-like accents throughout the shoe and pulls design details from the Air Jordan VIII “Playoffs” and Air Jordan VIII “Aqua”. In addition to the Air Jordan VIII, the brand will release three supplemental silhouettes next winter — the Air Jordan I, the Air Jordan XIV Low and the Air Jordan VII. Drafting colors from Jordan’s collegiate alma mater, this Air Jordan I features dark powder blue accents atop a white, premium smooth leather upper. Last released in 1999, the Air Jordan XIV Low arrives this holiday season with re-mastered construction and OG materials. The Air Jordan XIV Low draws from the sleek lines and aerodynamic design of one of the world’s fastest automobiles. The all-black nubuck leather upper is complemented by varsity royal accents and maize color splashes. Inspired by Jordan’s vibrant printed sweater and shorts he wore on camera in an iconic commercial, this Air Jordan VII features colorful hues, such as Bright Concord and Soar Blue, energizing the classic, white-based shoe. I was recently contacted by VoyageATL Magazine requesting to interview me for it's Trailblazers: Rewriting the Narrative series. The editorial staff seeks out hidden gems located in Atlanta and the surrounding area. It was a pleasure being selected and getting the opportunity to share a little bit of my journey with their readers. Check out a snippet of the interview inside. The Addicted Life is still going strong releasing pieces that are "Dope Simplicity." For their latest OG piece, they salute Shawn Carter aka Jay- Z. Jay is an inspiration to us all! The T-Shirts can be worn by both women and men. Fellas rock the Photo tee up with a pair of dope kicks. Ladies can match up the crop or full Tshirt with biker shorts & vans. See more inside. The visual for the hot track from Migos ft Nicki Minaj & Cardi B has finally arrived! The ladies look fly, Nicki really killed it with the pink lemonade braids hitting the floor!! Please ladies do NOT head to your local braider requesting this style. Being that 1) its a wig and 2) we don't want to see you in a local Walmart, dragging these inches almost tripping while trying to strut....GIRL!! Anyway! “MotorSport” is the lead single off Migos’ upcoming album Culture II, due in January. Check the video out below.